Négar Djavadi will be in conversation with author Laura van den Berg as part of the Transnational Literature Series. For more information, please contact series curator Shuchi Saraswat at shuchi@brooklinebooksmith.com. Négar Djavadi was born in Iran in 1969. She arrived in France at the age of eleven, having crossed the mountains of Kurdistan on horseback with her mother and sister. She lives in Paris. 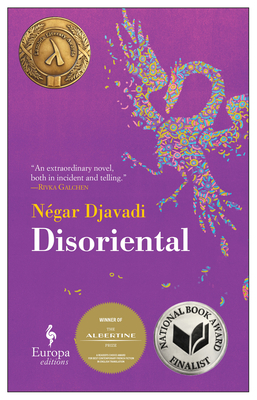 Disoriental, Djavadi’s debut novel, is the winner of several awards, including: the Prix du Style, Prix de la Porte Dorée, Prix du Roman News, Prix Première (RTBF), Emmanuel Roblès First Novel Prize, and Lire’s Best Debut Novel of 2016. Kimiâ Sadr fled Iran at the age of ten in the company of her mother and sisters to join her father in France. Now twenty-five and facing the future she has built for herself as well as the prospect of a new generation, Kimiâ is inundated by her own memories and the stories of her ancestors, which come to her in unstoppable, uncontainable waves. In the waiting room of a Parisian fertility clinic, generations of flamboyant Sadrs return to her, including her formidable great-grandfather Montazemolmolk, with his harem of fifty-two wives, and her parents, Darius and Sara, stalwart opponents of each regime that befalls them.